Red Bull Hack the Hits challenged a select group of students to design a musical instrument that introduces a novel way to make sounds. Students were encouraged to make use of tools and programs like Ableton, Leap Motion, and musical instruments to develop a new way to play sounds. Our team created an instrument called TouchTone that allows players to modulate sounds through potentiometers and MIDI channels. Gesturing over the Leap Motion attached to the body of the instrument affects the performer's on-screen visuals. My teammates and I were seen as underdogs for being the only out of state team competing against all California teams, from Stanford and UC Berkeley. We entered into the hackathon confident in our abilities to do well given our diverse skill sets in design and engineering, in addition to our shared love for music. Our project wowed the judges and audience members during the final presentation. The judging criteria had us consider how the expressive instrument might be used by someone in a live or studio setting. The projects were evaluated on the musicality, originality and usability of the instrument. How well could someone incorporate the sounds from the instrument into a performance or studio session? How well does the hack stand out next to all the other tech out there? Can anyone pick up your instrument and start playing quickly? None of my teammates had experience working with hardware prior to the competition. The three of us were used to making web apps or mobile apps for traditional hackathons. We had never made anything physical. This competition presented the opportunity for us all to do something brand new. In 24 hours, we created an instrument out of potentiometers, an Arduino and a Leap Motion. We intentionally designed TouchTone to look and play like a string instrument. Anyone who has played a real guitar or Guitar Hero would know how to pick it up to make sounds. The thin potentiometers send their outputs to the Arduino, which relays the information over a serial connection. The custom Max for Live patch receives this data. Once that is complete, the data gets separated according to the sensor. Finally, those values are transferred to the MIDI. Once we overcame some technical challenges, we divided up the work to play to our individual strengths in engineering and design. I took on the responsibility of designing and crafting the body of the instrument. I constructed the neck and body out of cardboard sheets. In thinking that our audience should be general, we sought to make the design of TouchTone look and feel like a children's toy. I chose to use red, blue, green and yellow as accent colors. Red glitter tape covered the entire instrument's body. Later on, we took feedback from different individuals that helped make our project look and feel more approachable. In addition, since we had access to a Leap Motion, I figured why not make use of it? We had access to a bunch of workshops throughout the event. Speakers encouraged us to think of how we might use various technologies and APIs in our projects. I reached out to one of the workshop leaders, Eric Tyler, founder of ImagineX, to learn how to use TouchDesigner to control the lights and visuals in an environment. Eric helped me put together a TouchDesigner project overnight that connected to the Leap Motion attached to the body of our instrument. Like a whammy bar but for visuals, the Leap Motion detects hands gestures and responds by manipulating the animations being displayed on TVs in the room. Our team put together one of the only projects that was actually usable by the end of the competition. Most of the other teams ran into technical difficulties that they could not resolve. When it came time for the demos, some instruments malfunctioned or performed differently than expected. Our project was unique in that we built our entire instrument from scratch. Another team, for example, put theirs together using parts from an existing electric guitar. Also, our instrument was built to do more than just play sounds. The Leap Motion allows users to manipulate the lights and visual effects inside a performance space. I enjoyed this hackathon very much because my teammates and I got to build something physical and functional, from start to finish. 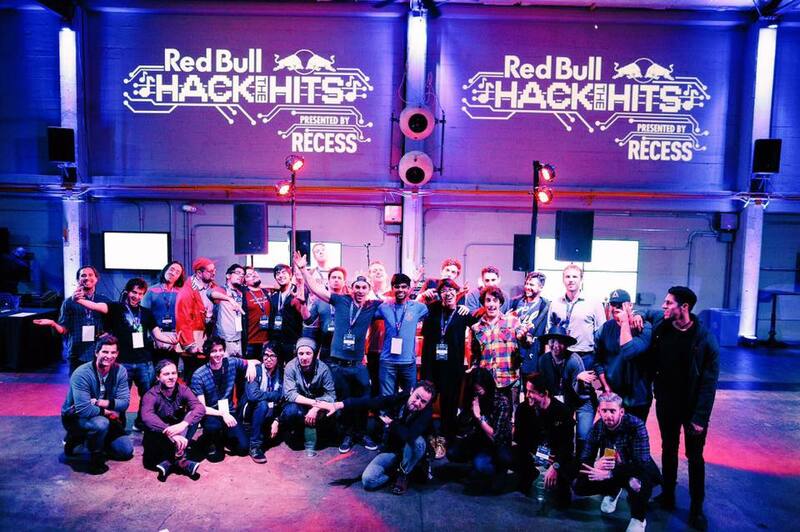 Forbes Magazine: "Diversity Wins Big at First-Ever Red Bull Hackathon"
CMU HCI Institute: "Diversity and Innovation Take First Place at Red Bull Hackathon"
A big group photo taken with all the participants, workshop leaders, organizers and judges! Here's Troyboi trying out the TouchTone for himself.